The first 2018 Galleries are added. The database is still not updated. The 2017 Galleries are added. I finally added the 2016 Galleries: Heron Island, Wolf Rock (Queensland), and the blue sharks of Rhode Island. The database has been updated, there are now more than 640 searchable species in the database. Most of the galleries have also been updated to new versions. I added the Galleries of 2015: Varadero and Jardines de la Reina in Summer and Kona in Winter. Highlights were diving with sharks, mantas, and dolphins. The database is not yet updated with new species from 2015. The database and some galleries have been updated. Now all pictures are searcheable. The number of species in the database is now around 580. The new galleries North Carolina and Saint Tropez have been uploaded. The database needs to be updated with the new species. Last changes for this year. Dive Sites Info got another interesting feature. You can now view all the species that have been photographed at a given dive site. The map shows you the exact location of the dive site. Only one picture of each species is shown, ordered by the taxonomic class. If you now click the scientific name, you will see all pictures from this species on various dive sites. From there you can access the other dive sites and so on. This allows you to access all the information in the database. The Dive Sites Info got a major update. Just have a look, I think it is now quite useful. Finally the database has been updated with the pictures from 2012 and 2013. There are now more than 550 species searchable in the database. On the results page you get the taxa and the most important photographic data of all species. You can also access a map showing the dive site where the picture has been taken. Two new galleries were added: Heron Island and California. I still need to update the database to enable searching the new species. Some of the older galleries have been updated. The structure of the menus has been improved. "Search" is now directly accessible on the left side. From the "Search Results" you can now access a map with the location of the dive site. This map is now included into the website rather than being accessed via an external link. It uses the Google Maps API and can be scaled as usual for Google maps. The galleries of 2012 have been updated, species identified, and GPS information added to each picture. The older galleries still have to be worked on, which will need some time. The database was also updated with GPS information for all dive sites. This is sometimes not very accurate since in many cases I had to guess the exact positions or use not very accurate dive maps or information from the internet. At least the approximate locations are shown and will be updated as soon as I have better coordinates. All results from species search (including all older pictures) now show the location where the picture was taken with a link to Google Maps. A couple of pictures have been added from diving in La Ciotat, a small town close to Marseille, France. In this gallery I started including GPS information. If you click the icon you will be directed to Google Maps. I also started setting up a database with all dive sites I visited during the last years. The problem is that I don't have accurate GPS data in most cases, so I have to estimate the position from maps and from what I remember. The new galleries of Jardines de la Reina from my visit in April have been added. My second visit to this place was again spectacular. I guess, in this week less than 20 divers were sharing the whole area. Since access is very restricted, there are also no day trips, which makes the Jardines one of the most exclusive dive sites worldwide. The searchable database is now updated with the 2011 galleries. The database contains more pictures than the galleries, since I put some pictures in hidden galleries that are only accessible via the database. This is just to avoid too much crowding in the galleries. The "Equipment" got also a substantial update. I added some notes on the Nikon D7000, but also updated the information on lenses, strobes, and focus lights. The Galleries Havana 2011 and Maria La Gorda 2011 have been added. The database has not yet been updated, so the species in the new galleries are not searchable yet. Close to Havana I found the (to me) new dive side "Kilometer 35". By car it is about 40 Min drive from the center. Although the landscape there is not appealing (only rocks, no shade and remainings of an old oil field), the diving is nice with clear water and a lot of fish. I have even seen several barracudas there. Maria la Gorda, on the other hand, was disappointing, compared to the other times I had been there. While the underwater landscape is still excellent and worth a visit, most of the corals are dead. That is probably due to several devastating hurricanes that hit this area in the last years. The service in the hotel and restaurant was also worse than in recent years. The search pages have been considerably improved. You can now also search German names of the species in the Galleries. If you select a Common, German, or Scientific name in the drop-down menus, the complete taxa of the species is automatically shown. You can now search this species in the Galleries or in external databases (WORMS and ITIS). The search table can also be used to translate German into English common names and vice versa. The second search table lets you select a complete Order or Family of species. Be aware that this might result in a large number of hits. The third search table, finally, lets you search fragments of names that you directly type in. Just play with the search functions, I think they are now quite useful. In future I plan to add a search by region, but that requires some time to re-structure the databases. It took a while, but I finally got a D7000 as replacement for my D80. What a camera! The performance, especially under low light conditions, is amazing. As underwater housing I chose the Aquatica D7000 since it got excellent reviews. I just got it a couple of days ago and checked it in the pool. A great combination of camera and housing and I am really looking forward to get it underwater. I spent the two last weeks in December in Hawaii. Diving was good, although the Hawaiian coast suffers from overfishing and lack of protection. More frustrating was that the underwater housing of my Nikon D80 broke during the trip. A fine crack in the body of the housing close to the main O-ring seal results in a major leak. There is nothing that can be done to repair it, and therefore I have to look around for a new underwater housing. So, I enjoyed diving without camera which was also great. 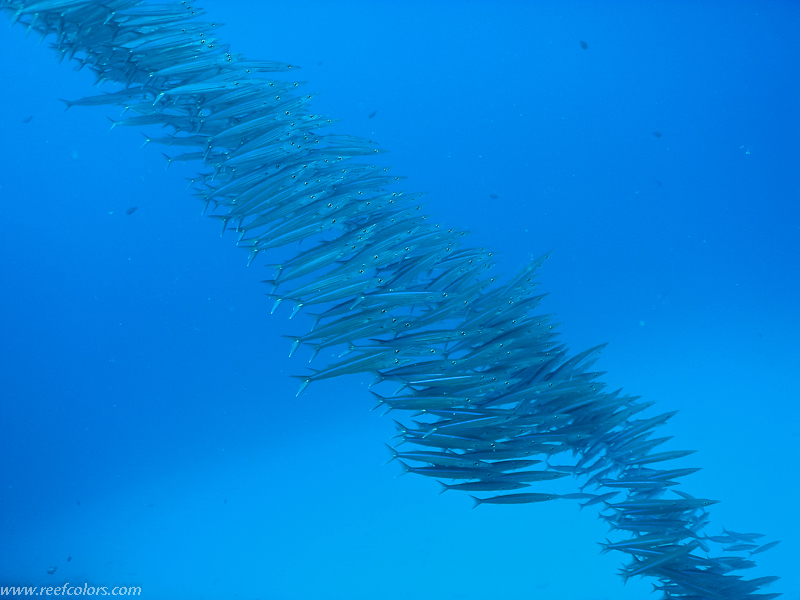 The only picture I got was a school of barracudas shot with a small digital camera I got during one dive. Original or copy? A puffer and a filefish look almost the same. Why this has advantages for the filefish is explained in Science and the Reef. The search pages have been slightly improved. I finally updated the database, there are now more than 420 searchable species in the galleries. You can search the common names or scientific names or the families. Try the taxa search which shows you the complete tree of life in pictures from the database. You don't have to know the scientific names of phylum, class, order etc., just browse the pictures. There are still some bugs in the search, I therefore plan to re-design it completely. Comments and suggestions are very welcome! After travelling to Australia this summer I finally added four new galleries. One gallery with underwater pictures from Heron Island and one with a manta ray and some sharks, also from Heron Island. The two other galleries show pictures taken at the Fish Rock in New South Wales. Sill, the data base needs to be updated, work for the Winter months. 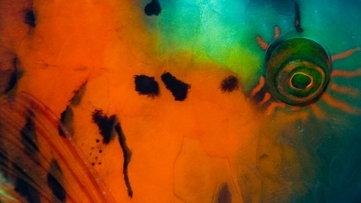 Check out the new galleries "Jardines de la Reina". This remote place is Cuba's best diving site and since many years strictly protected. 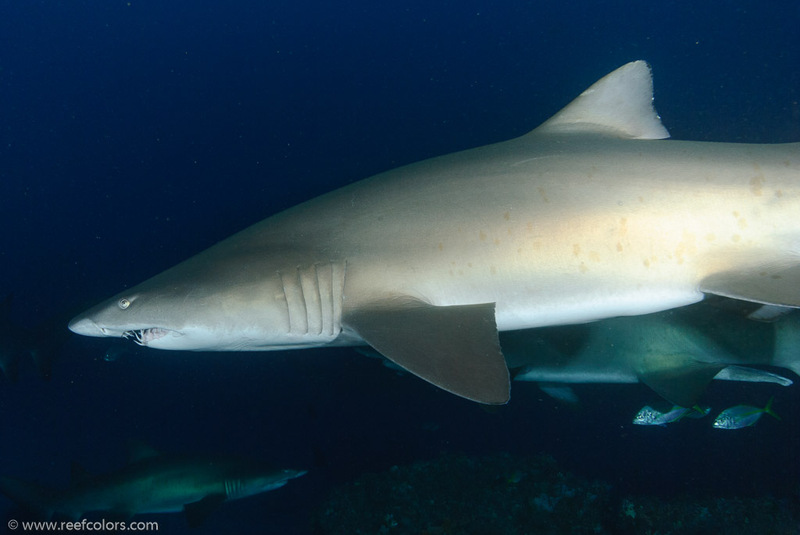 I added separate galleries for the Caribbean Reef Sharks and the Silky Sharks which are abundant in this spectacular place. I still need to identify many of the species in the pictures and update the data base. The "Equipment" pages have been updated. The database has been updated. Now all 1256 pictures are searchable. There are 330 different species in the database, most from the Caribbean. 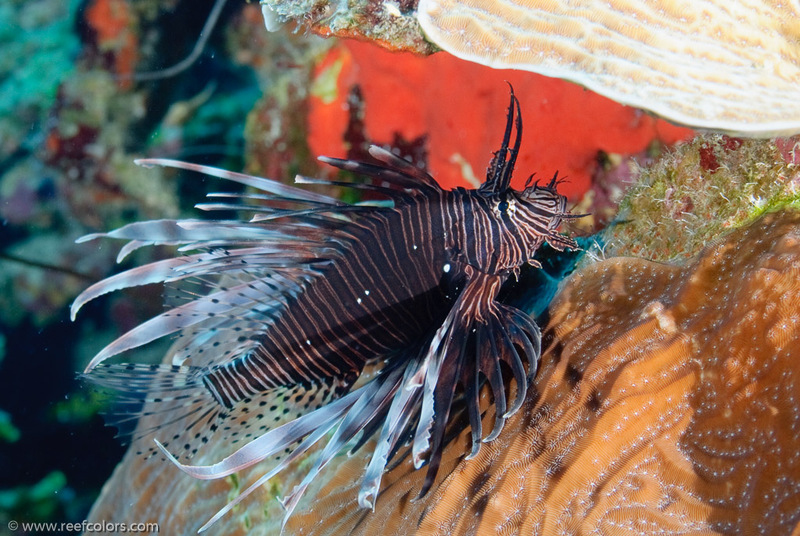 A short page about the lionfish invading Cuban reefs has been added. The new galleries of August and September 2009 are added: Havana II and Maria La Gorda II. The species in these galleries are not yet searchable, I have to update the database. Major change in the galleries. The Turning Gate (TTG) Highslide Gallery is used to generate the galleries in Lightroom. The visual effect is similar to Flash, but without using a Flash plug- in since TTG Highslide is based only on HTML and Java Script. The engine behind the TTG Highslide Gallery is based on Highslide JS which I also use on several pages (e. g. for the Search Results page). The "Species Search" has been replaced by "Taxa Search" which allows to search the complete taxonomic tree of all species in the database. Thumbnails with examples of each class, family, order etc. are shown to make it easier to find specific species. The search function has been improved. The "Science and the Reef" has been modified. Still not much content, but I don't have as much time as I wished. The search menu has been extended. You can now select between "Name Search" and "Species Search". The new "Species Search" shows you thumbnails of representative species ordered by scientific classification (order or family). If you click it you will get all pictures of species of this order or family in the galleries. So far, only fishes have been implemented. New galleries "Cuba 2009" have been added. The design of the web site has been improved. The search function has been improved. In the results page you get also Class and Order of the species found in the database. An external search via the WoRMS (World Register of Marine Species) database has been implemented. The "Science and the Reef" has been improved a little bit. The search function has been extended. Now, species assigned in all the galleries can be searched. A preview is shown in thumbnails. Now you can "Search the Reef". You can search common or scientific names of the species in the pictures. Programming in MySQL/PHP was painful, but now its working. So far, I added only the data (from the metadata of the pictures) of the 2008 galleries. The others will follow as soon as I have time. Gallery Islas Medas added. These tiny islands at the Costa Brava in Spain are protected and show how rich the Mediterranean Sea once was. Gallery Grevelingenmeer added. Although the visibility was very low I got a couple of nice pictures of lobsters. First page of Chemistry of the Reef added. In future I plan to add more discussions of chemical processes of importance to coral reefs. I also added some information "about me". Maria la Gorda info added. I did not yet have time to identify the creatures in the Bay of Pigs and Maria La Gorda galleries.